Setting psychological targets. Elevating ambition. In advance. The job of a leader is to get more from the team than the team believes they can accomplish. Having the vision, courage and belief in possibilities is fundamental to being a difference-making leader, in good times and tough times. Arbitrary target setting is not the same thing as setting psychological targets. “We will achieve ___% growth selling the same products the same way into the same shrinking market at the same price without adapting our story” is not setting a psychological target or elevating the ambitions of the team. Companies large-and-small, public-and-private face that challenge. Now, on the other hand, let’s revisit JFK’s “man on the moon” speech at Rice Stadium on May 25, 1961. Make no mistake, some of the people closest to Kennedy and many of the people within NASA thought he had lost his mind when he made this speech. But on July 20, 1969 when “the eagle landed,” and a few hours later, on July 21st when Neil Armstrong took his “one small step,” the accomplishment tied back to the psychological target and elevated ambition Kennedy provided. The speech is rife with reasons the audacious task could and should be done, each tied to a principle and / or an accomplishment that gave reason-to-believe it could and should be done. Johnson was deeply committed to the man-on-the-moon goal when he took over for Kennedy after his assassination — and success was made possible, in part, by a mindset that Johnson portrayed when taking over a debate team that had “never won anything” decades before. Honest Abe, Rough-Riding Teddy, FDR and LBJ were tasked with leading during very turbulent times. Any turbulence we face might be less grandiose in nature, but to the teams we lead, it may be every bit as impactful. Lessons: From Lincoln — How curious are we? How compelled are we to understand? From Theodore Roosevelt — how well are we connecting to those around us? From Franklin Roosevelt — how deep, talented and loyal is the team we’re assembling and sustaining? And from Johnson — what psychological targets are we putting in place to elevate the ambitions of the team and those whom we influence? The Daily Difference will take some time off for Spring Break next week, and return on March 25th. The recurring theme in Goodwin’s capture of what made these four presidents such strong leaders during turbulent times is consistency. The best hope we have in turbulent times is to have put in place teams and approaches that serve us well with tailwinds, no winds and in turbulent times. Roosevelt’s success during tough times was because he’s built the foundation before the times got tough. The last thing our teams need in tough times is abrupt changes in our approach, unless the times are perfect-storm turbulent. And it really does start with talent. Assemble and sustain a team that will remain together… Lead them consistently and predictably and no matter the turbulence, smooth navigation and safe arrival become much more likely. “Management by walking around,” was the way it was described (among others by Tom Peters in “In Search of Excellence”) and it was the “it” theory of leadership for awhile. It still should be. If we’re leaders, it’s almost all about connecting, and it’s almost always about connecting. The four presidents — Lincoln, both Roosevelts and LBJ, the subjects of DKG’s book — all connected — and unlike our perception of today’s politicians, they connected across the aisle, across race lines, across socio-economic lines; across lines in general. “The defective quality of being a stranger” is borne out by silver-tower leaders who never leave the silver-tower. I company I know well had blue carpet (very expensive blue carpet) in the executive area. The running shtick in that company was “they’d have to leave the blue carpet to know what’s really going on here…” The execs, it seemed, rarely left the confines of the exec offices. If companies had a Life360™ – like app on their executive team, it would be interesting to see how frequently they “went around enough” to get connected. Open-door policies are good, and I’ve never seen a company that didn’t claim to have one. The open-door never works, though, unless the leader walks out through that open door to get accustomed to the team and have them get accustomed to the leader. The word “never” is one I use sparingly. I use it very intentionally here. If a leader never gets out to connect, they could remove their doors altogether and it wouldn’t matter. If being a stranger is a “defective quality” for a leader, difference makers know that getting connected is the antidote — not to mention the foundation for leading, and not just in turbulent times. If we only bring unflagging curiosity to the table every day, we’ll move forward, every day. And if we truly seek — if we’re compelled — to understand, to get to the “Why?” we’ll have no choice but to make a difference. It’s not about how quick or bright we are. It’s about how much we want to learn and how deeply we want to understand. It worked out ok for Abe. One could say he made a difference, right? I won’t even apologize for going all churchy on you today. Sorry. (Wait! I just said I wouldn’t do that…) There’s a business lesson here, too. Everything has an acronym these days, and “BFF” has pretty much marginalized the idea of “best” friendship. But that’s not the point. Pastor Mike pointed out that 89% of 30-year-olds whose parents took them to church growing up have an active, fulfilling Faith life, compared to only 11% of 30-year-olds whose parents didn’t take them to church. But that’s not the point, either. “What is the point, Heston?” you’re thinking? The point is, it’s not only about belief. Something has to activate it in order for belief to take us places while we’re here, on this planet. I’m not going to go all-chapter-and-verse on you. The link to the sermon will, however. 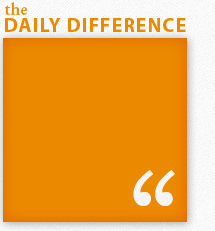 That said, for 15 years The Daily Diff has been based on the fact that belief is the most important ingredient in a successful selling / business life. The point is, it must be activated in order to really take us places. And the activator is to follow. To follow. Reading-between-the-lines isn’t necessary to get Pastor Mike’s context. The business application is almost as apparent. It’s one thing — the biggest thing, perhaps — to believe. Unless we follow that belief, though — actively, in an engaged, committed manner — the magic might never happen and the depth might never be realized. Believe in your company. Believe in your product. Believe in your team, your abilities and your gifts. And follow that belief actively, with passion and commitment to making a difference. Since I started unapologetically on a Faith-based-angle, I could take the obvious approach with the headline and suggest who our “BFF” needs to be. Instead, let me try to paraphrase my notes from Sunday morning, for this Monday morning edition, with apologies to Pastor Mike if I’m too far outside the lines. The BFF angle I’m suggesting here is that when we Believe and we actively Follow, Fulfillment is the prize. It feels to me like a prize worth pursuing. In a quote the Google® attributes to everyone from Ghandi to “Fake Buddah,” we’ve heard that “pain is inevitable but suffering / misery is optional.” That is the power Frankl references. The power to choose our response. For the record, I say we go with the experience and advice of someone who survived one of history’s greatest horrors on this topic, ok? Stimulus? Maybe something spectacular just happened. Maybe something that can only be described with disgust and profanity just happened. Response; we can bask or gloat, we can cry, mope and play the victim, or we can choose, carefully, a measured response in both the good times and the bad. Because, we never really know which scenario is at play. Power, or whatever we relate to power, is rarely in our grasp. The power to choose our response, however, is there all the time. Do we choose more often or just react? Do we choose well, or do we squander the power we’ve got at our disposal? Whatever we’re facing today, the best-of-the-best or the lowest-of-lows, let’s choose to choose, and choose well.